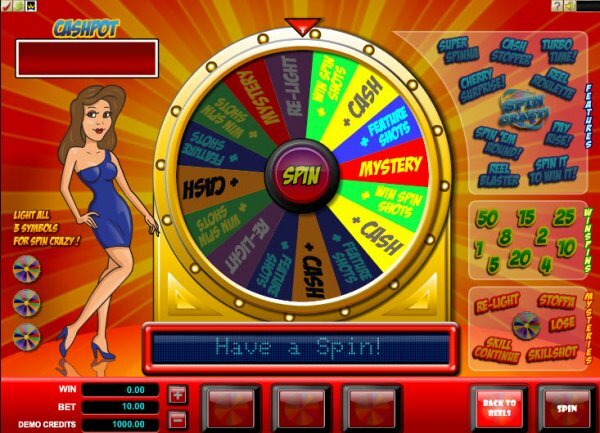 Spin Crazy is a modern version of a classic slot machine, which keeps the number of reels and lines, and even the graphics to some extent, but crams in it a lot more features than you would’ve gotten from pub slots. Microgaming has a long list of such slots, all of them having the same betting system and using nudges, along with other things which are specific to each title. As a classic slot, it offers a limited number of reels/lines, with 3 for the former, 1 for the latter. However, the bonus game part is good enough for a modern title. On top of that, there is a maximum prize of $20,000 on the line. 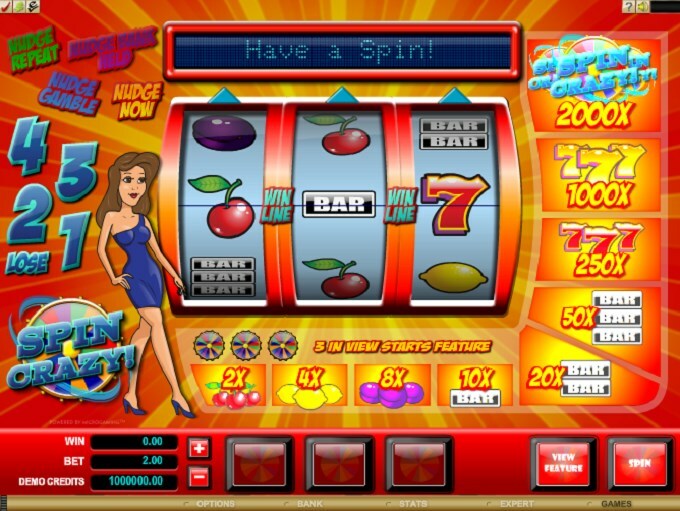 In this case, the features which are used consist in both nudges and bonus games. The bonus feature is the one you will enjoy most, with a wheel of fortune that grants you prizes. Depending on your luck, you could get all sorts of other features triggered through the wheel. Starting up the feature requires that three scattered Wheel of Fortune symbols are present. These only have to be in view, so it doesn’t matter if they’re on the payline or not. The start of the bonus game will take you to a new screen, where a young lady sits next to a wheel of fortune. The wheel will give you cash prizes, feature shots and bonus games like Re-Light, Mystery, Win Spin Shots, Reel Blaster, Cherry Surprise, Super Spinna, Cash Stopper, Turbo Time and so on. It can be a great feature, a lot of fun and with plenty of different things for you to do. If you have the impression that a classic slot machine can only be boring, Spin Crazy will prove you wrong. Each time you trigger the Wheel feature you will get something new and exciting from it. You only need one coin to wager in this game, so the only thing to consider is how much you can afford to use each round. The minimum value is $0.10, the maximum is $10. With a bit of luck, you will walk away with 2,000 coins, which in this case means $20,000 or less. The design resembles a game show of some sort, with an attractive assistant sitting next to the reels in the base game, or the wheel during the bonus game. The reels are surrounded by the paytable info and the Nudge section. There is nothing extraordinary about the design of Spin Crazy, it’s a rather normal one, but that’s actually something that you don’t see too often from classic titles. Symbols: Game Logo (2,000 coins), Wheel of fortune (bonus), Yellow 7 (1,000 coins), Red 7 (250 coins), Triple Bar (50 coins), Double Bar (20 coins), One Bar (10 coins), Plum (8 coins), Lemon (4 coins) and Cherry (2 coins). The wealth of features available in this game recommend it for the players that are sick of the classic slot machines and want something different, without necessarily looking for a 5 reel title. The Spin Crazy slot machine is offered through the Microgaming platform, so if you want to play it for real or just to practice, look out for casinos that use it.